Should I go barefoot? I don’t know if I have the nerve. One question. Were you born with shoes on? Of course you should go barefoot. Stop being such a pansy. I don’t follow your logic. We were born with no clothes on. Do you mean we should all go around naked? Are you from the press? Because I’ve had bad experiences with the press (well, one) twisting my words around and all that and trying to make me say something I didn’t say? Because if you’re with the press, I think you should at least come by and get a photo. At least give me that much. I’m at 449 Slater. Basement suite. Use the side door (not the front). And come between, say, 3:15 and 3:30. On Tuesdays. Thanks. No, I’m not with the press. I’m just nervous about going barefoot. Maybe stepping on something, you know. Why do you wear a skirt when it’s so kold (sic) out? Thanks so much for pointing this out (as if I haven’t heard it before). It’s not a SKIRT, it’s a ZEPETE. Rhymes with zip-it-eh! 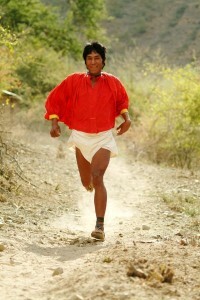 It’s Raramuri for – well, I don’t know what, but not a SKIRT!!!! Okay? Message received everybody? ZEPETE. ZEPETE. ZEPETE. ZEPETE. ZEPETE. So, I don’t want to hear about it again. It’s not that I’m sensitive, because I’m not. You can’t afford to be sensitive when you’re out there living the unconventional. That’s a lesson for everybody. Don’t be sensitive. Don’t be crushed (courtesy of the great Dr. Natron Diamond). And, oh, yeah, I have winter gear. When it snows, I wear the ZEPETE on top. For inspiration. So, are we finally good on the skirt thing? We’re a new web comedy series about running, relationships and mid-life redemption. If you’re over 40, a middle-to-back-of-the-packer or a runner at heart you’ve found the right crowd. Hell, you’ll fit right in! And we’re all going for a spin on April 24 (4:00 p.m. Eastern time) with the first two episodes of Season 1. Sign up to our e-mail list and we’ll deliver the episodes, and all the great content we’ve got going, right to your door (well, inbox). April 24. It’s a Wednesday. 4:00 p.m. Eastern. How often can you say you had fun running when you still had Myles to Go. See you Wednesday, April 24, 4:00 p.m. Eastern.